What is the raw/barf diet? In a nutshell, it is a homemade diet based on raw, meaty, and fresh foods. Would you want to eat something that stayed "okay to eat" on the shelf for years? Do you think that it is really all that healthy? I don't. And for that and many other reasons, I've switched my dogs to the raw diet and a high quality holistic kibble such as Innova. The raw diet might not be for everyone's lifestyle or their dogs, but its what I do. I only want the best for my kids. Google the RAW diet or BARF diet for more info. Remember: this is NOT a diet you can do casually. It takes time and effort to learn the correct proportions and to foster a positive relationship with your butcher. It is absolutely important to feed the correct amounts of bone, meat, and veggies. Through knowing the meat managers at my local grocery store and scouring the ads for deals, I have been able to find chicken quarters for as little 19 cents per lbs. Another great recipe for raw food dieters is Satin Balls. Great for getting dogs to gain weight. A Raw dieter, Maggie the 20 year old Beagle. Read how raw kept Maggie alive. Check out those white and pearly teeth. Joy was on kibble for 4.5 years before she joined Maud on August 15th, 2006. On the left, you can see that on August 15th, Joy has nasty plague and tarter build-up. And her case is EXTREMELY mild compared to what I have seen. 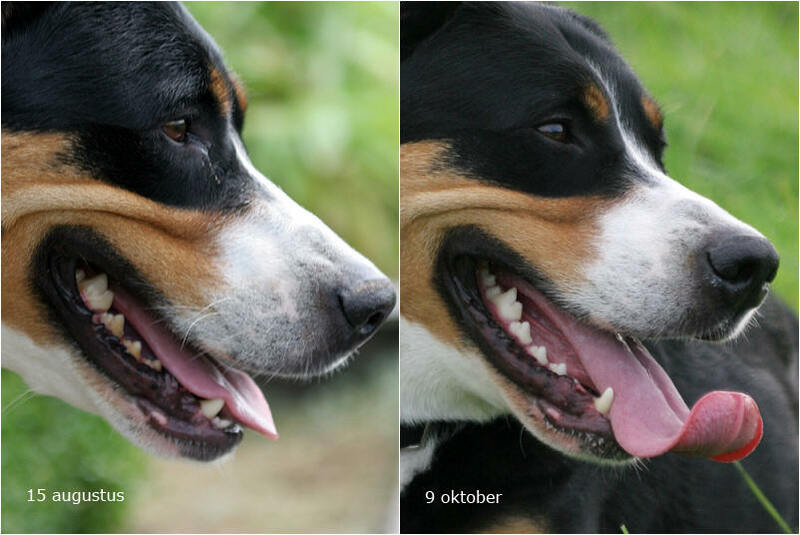 After feeding RAW bones (raw only, feed at your own risk), you can see a drastic change in her pretty smile. Feeding raw bone greatly reduces the need for teeth scaling. Joy is owned by Maud and lives in the Netherlands. I don't have an exact recipe per se, but a general guideline. I put everything in a food processor (and I have a separate one for humans and one for the veggie mix), blend until like a slushie, mix all together, then freeze in those glad or ziploc containers. For the organs, I chop them into chunks before processing. You'll also need to chop the herbs a little so it doesn't get stuck on the grinder or processor. I usually use 2-4 HUGE mixing bowls or soup pots to do the mixing. This will become one huge disgusting mess. In addition to the veggie mix when I feed (~1/3 to 1/2 cup for a Swissy per meal), I might throw in left over rice or pasta, oatmeal, a can of fish, cod liver oil, apple cider vinegar, ground vitamin C, yogurt, ground flax seeds, and coat supplement. I also add whatever I have around the house too (green beans, cranberries) in addition to the ingredients below. Please remember to not feed your dog onion (also not too much garlic) or grapes with seeds. Chocolate, sugar substitues, and human meds (aside from the vet's direction) are No-No's! Grow hair on a Door knob - very ooey gooey mess, a delight for the dogs - this recipe is in The Quincy Kennel Clubs cookbook and was submitted by Virginia Knocke. Method: Have peanut butter at room temperature. Mix all ingredients together. This will be very thick and sticky. Stores indefinitely in refrigerator. Make into balls according to size of the dog. Guaranteed to grow hair - even on doorknobs. If you can get the doorknobs to eat and digest this - it will grow hair! This tends to not stick to plastic spoons. Small dogs 1-3 teaspoons daily, Large dogs 1-2 tablespoons daily. Directions for mixing the solution together: Pour 6 ounces of isopropyl alcohol in to a plastic applicator bottle.Add 1/2 tablespoon of boric acid powder.Add 2 ounces of white vinegar. shake it up some more. Squirt the solution inside your dog's ear until the ear canal is completely full. Massage the outside of the ear to help slosh the cleaning solution around inside. Hold the dog still for about a minute. Be sure to shake the solution up really well before each and every time you use it. The boric acid has a tendency to settle at the bottom of the bottle. Store at room temperature. Use the cleaning solution daily until you start to see some improvement. Gradually cut back to once per week when you it's doing some good. When the ear seems completely free of infection, you can go two weeks between treatments. I use this stuff, sometimes called spaniel ear cleaner, on Mouse maybe twice a month, especially during water rescue season. I used it on my Lowchen girl when I first got her, and her ears have been great since. However, I don't squirt the solution in the ear. I soak a cotton ball in the solution, and then put the cotton ball into the ear. Then squeeze and massage the ear, remove the used cotton ball. Massage the ear some more. Then use a clean cotton ball to wipe up the excess. I've found that using a hemostat to maneuver the cotton ball is much easier than fingers. If you have trouble finding boric acid, it is usually in the pharmacy dept of the grocery store or even at Wal-Mart.